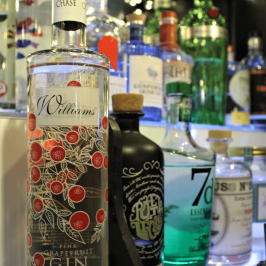 An award winning gin from the Netherlands, Sloane’s is ‘Unashamedly inspired by great gins’ and aspires to be the best. With a fairly unique method of distilling each botanical separately making it full of flavour while still having the smooth spirit after being distilled 7 times. It is named after Sir Hans Sloane who was an 18th century botanist and said to discover a lot of botanicals we see in many gins today. Sloane’s has 9 botanicals in total, but it is the citrus peel and vanilla pods that come through most I find giving it an almost creamy finish. While looking around this one jumped out at me straight away as we love Star Wars! And it’s not just a good pun either.